Ten years passed between the organization of Kansas as a territory in 1854, and the creation of the state's first geological survey. In some ways, those years were for Kansas like Dickens' England, filled with the best and worst of times. The state's pioneers faced all the typical troubles that accompanied life on the American frontier: hostile natives, crop failures, awesome and impetuous weather. As if those impediments were not sufficient, Kansans also suffered through the turmoil of the dispute over slavery, until something akin to guerilla warfare began to dominate nearly all affairs in the eastern third of the state. Although the free-versus-slave dispute culminated with the sacking of Lawrence by Quantrill's raiders in 1863, border troubles were dangerously common during many of the years from 1854 to 1864. Yet the economy of the state was good and Kansas remained relatively isolated from the Civil War. Still, it is surprising that the Kansas legislature established a scientific institution so early. The first geological survey of the state, established in 1864, was not the initial attempt to begin a formal reconnaissance of the state's geology; the legislature tried at least four times before 1864, representing remarkable attempts at science in a state so embroiled in other problems. However, too much can be made of those attempts; legislative interest in science was generally limited to geology, at least until the foundation of state-supported universities, and geology aroused concern only because of the economic returns it seemed to promise (for a comprehensive discussion of the early history of science in Kansas, see Peterson, 1987). Kansas was hardly the first state to conceive of a geological survey. In 1823, Denison Olmstead, trained at Yale by Benjamin Silliman, Sr., undertook a study of North Carolina's rocks and minerals. A full-blown, state-supported survey appeared seven years later in Massachusetts (Hendrickson, 1976, p. 133), and between 1830 and 1850, 22 states created surveys of one sort or another for various durations, with seemingly only one thing in common: surveys flourished, for the most part, when the economy was healthy and their existence was threatened when times were hard. In spite of lofty speeches about attaining scientific knowledge, most legislators felt they could risk money on state surveys only when they could afford to lose it. Even though the funders realized the prospect was a gamble, they always expected hard and practical returns. Those great expectations led to an immediate conflict in many states: geologists in charge of state surveys often wanted both practical results and new scientific findings. At times they were able to achieve both, usually by steering somewhere between the extremes of pure and practical research. At other times they moved to the side of basic science and made important contributions to the emerging discipline of geology (Aldrich, 1979). Yet in most cases, state government demanded and received an emphasis on practical results, sometimes to the exclusion of pure research altogether, and discontinued surveys when they did not produce practical results. Funding of geological surveys was one of the earliest and most important means of state government support for science. In some states the relationship of science and government was successful, resulting in a graceful and productive period of cooperation. In Kansas, government and geology stalked each other, circling eye-to-eye before embracing, and even then the partnership was short and fitful. The first attempt to establish a survey was made in 1854, not by Kansas Territory but by the federal government. Congress considered a bill authorizing the construction of territorial roads and bridges, the improvement of rivers, and a geological survey of the territory (Taft, 1953, p. 293), which stretched well into present-day Colorado. The House of Representatives deemed most of the bill inexpedient (33rd Congressional Session, 1855) although it did appropriate money for the improvement of roads, and some of that money was used, ironically enough, to employ Frederick Hawn as a surveyor. The second attempt came a year later, when the territorial legislature tried to change Congress's mind about the expediency of a geological survey. The legislature's Committee of Agriculture was instructed to "report by resolution, petition, or memorial to Congress in favor of a Geological Survey of Kansas Territory" (House Journal, 1855, p. 86). Known as the Bogus Legislature, this body was probably elected more by Missourians than Kansans, and became another casualty in the border war over slavery. Perhaps because of the questionable legitimacy of the body making the request, or more probably because Congress still considered a survey unnecessary, the second request also died. Attempt number three waited until two years later, during the 1857 session of the legislature, when territorial governor John W. Geary included a request for a geological survey in his message to the lawmakers, calling the survey "...so necessary as merely to require notice. Provision for this useful work should immediately be made" (House Journal, 1857, p. 21). Geary's relationship with the legislature was not good, however, and the beginning of a survey obviously required more than mere notice. No bill was introduced and no survey created. Geary left office, and Kansas, several months later, and his attempt to begin a survey was the last formal effort at the survey in territorial Kansas. Kansas Territory became a state in 1861, and in determining the state's borders, the organizers lopped off a large section of western Kansas that extended to the Continental Divide in the Rocky Mountains of today's Colorado. The organizers apparently felt that the Territory was too large, and they wanted to rid Kansas of the influence of Rocky Mountain gold seekers. Ironically, they had shorn away an area that was probably the most geologically interesting in the Territory, an area of major economic consequence through its gold and silver deposits. Still, that grand giveaway did not stifle attempts to create a geological survey. In 1863, State Representative D. T. Mitchell of Lecompton introduced House Bill 189 establishing a geological survey; it survived a second reading in the House before it failed, marking the last unsuccessful attempt at a survey prior to 1864. It is difficult to gauge the popular support for any of these proposals. Newspapers occasionally supported some of the legislation, but their efforts hardly amounted to a clamor. Even though the scarcity of geologic materials for housing and fuel seemed to weigh heavily on the minds of pioneers, there was certainly no evidence of a public outcry supporting a geological survey during those four fruitless tries. But a change in attitude may have occurred during those years, and it may have been the reason that the proposal of 1864 elicited more popular response than any of the previous attempts. Perhaps in the years from 1854 to 1864, the state's population became more aware of the problems invoked by geologic ignorance. Too, the economic climate had improved by 1864, to the point that legislators may have felt they could risk some money on a scientific enterprise. With the establishment of state-supported universities, the state's populace also gained some appreciation for science that might have made a difference. Finally, perhaps the combination of personalities in state government was sufficiently strong and in the proper mix to aid the survey bill's passage. For those reasons, and perhaps others, the attitude toward a survey had changed enough that the 1864 proposal did not suffer the same fate as its earlier relation. Certainly the political process that succeeded in creating a survey was the most elaborate and drawn out of all the attempts, filled with intrigue, twists and turns, and old-fashioned political horse trading. It began with Governor Thomas Carney, a rather unlikely sort who had previously demonstrated no inordinate interest in the problems of science or geology. Born in Ohio, Carney built a thriving wholesale business before moving west to Leavenworth in 1858. Elected to the Kansas House in 1861, Carney won the governorship in 1863 with the support of Charles Robinson. Though he held office during some of the most turbulent times in Kansas history, Carney--whose picture has an almost priestly, calm air about it--ran a staid and solid administration and for the most part was able to protect Kansas through the treacherous years of early statehood and Civil War. Less noted by contemporaries was the creation of the survey. Carney introduced the subject in his 1864 message to the legislature and based his defense of a survey appropriation on the state's ignorance of minerals, the need to classify soils for agricultural purposes, and especially the demand for coal: "The almost fabulous prices which fuel commands in our cities and principal towns must retard their growth, and occasion distress and suffering among the poorer classes" (House Journal, 1864, p. 26). Carney concluded that because "the wealth of Kansas lies in her soils ... it seems to be eminently proper that this subject [a geological survey] should engage your careful and considerate attention" (House Journal, 1864, p. 26). The matter received attention almost immediately, though the attention was not always considerate. Four days after Carney's speech, Representative J. B. Laing from Leavenworth introduced a bill appropriating $3,500 for a geological survey. Entitled "An Act for Establishing a Geological Survey," the bill charged the survey with classifying soils and rocks, analyzing salt springs, reporting on valuable mineral deposits, and building "a geological cabinet, illustrating the geology of Kansas..." (House Journal, 1864, p. 111). The bill was referred to the five-man Committee on Agriculture, Manufacture, and Mining. For the most part the newspapers of the state gave the bill a polite and, in some cases, enthusiastic reception. In nearly all instances that enthusiasm was based not so much on what might be learned from such a survey, but instead upon how that knowledge might be applied. "The age in which we live has brought to clear light the fact that the sciences may be applied to agriculture and the various branches of common industry, with most favorable results," wrote John Speer in the Kansas Tribune from Lawrence. "... it is a fact that this State, notwithstanding it has been traveled over so much, is still terra incognita in the strict sense of the term" (Kansas Tribune, 19 January 1864, p. 2). Chimed in the Leavenworth Daily Conservative, "It is hoped that the bill will be liberal and thorough in its provisions" (Leavenworth Daily Conservative, 16 January 1864, p. 2). "In conclusion, we may be permitted to remark that, though we are disciples of progress, and are willing and eager to learn, we deem it advisable, for the permanent growth and future prosperity of our State, that we should 'hasten slowly,' lest, peradventure, we should make 'more haste than speed,' and that, in view of the limited population and tax-payers' ability of the State, instead of running the car of progress, 'high pressure' system, we should decidedly incline to favor the narrow gauge, single track, low pressure style, with Prudence ever on the lookout--Economy, master and conductor of the train--Caution standing ready to 'put down the brake,' and all hands on watch to prevent deadheads from stealing rides at the expense of the honest stockholders" (House Journal, 1864, p. 93). Yet the bill survived that diatribe. It did so because of a crowded cast of characters and a series of coincidences that managed to put the proposal back on track. In addition, the state's newspapers breathed new life into the proposal. The Leavenworth Conservative jeered at the report of the "disciples of Progress," again because of the benefits the newspaper believed the survey might produce (Leavenworth Daily Conservative, 21 January 1864, p. 2). Probably more important, however, were the personalities that now appeared. One much-studied but shadowy figure was Watson Foster. Born in Vermont, Foster moved to Kansas via Indiana and Illinois, settling first in Lyon County, then in 1862 moving to Douglas County where he was elected to the state legislature (Malin, 1956). In 1864, Foster moved to Leavenworth and began lecturing on science at Leavenworth College. In addition to speaking, Foster constantly seemed to be pontificating publicly on scientific subjects; at one point the Emporia News complained about "that superlative humbug and gas bag, Professor (of what?) Foster.... We are surprised that he is not delivering that 'lecture' on chemistry, which he learned when he was a boy" (Emporia News, 6 February 1864, p. 2). Foster's scientific interests certainly included geology. He sat on the legislative committee that considered the 1863 survey proposal, and in a letter to Governor Carney, Foster claimed to have written the 1864 version of the bill creating a survey (Foster to Carney, 22 February 1864, Carney Collection, State Historical Society). It may have been Foster's influence that led Leavenworth's Representative Laing to introduce the bill, and he may have had a hand in the Leavenworth Conservative's outspoken support of the survey. It should be noted, however, that Leavenworth was a something of a mining town at the time--coal was being dug from underground mines--and that may have influenced Laing and the Conservative more than Foster. A second personality appeared rather suddenly and at a propitious moment in the survey debate. Benjamin F. Mudge (1817-1879) was a native of Maine who had studied classics and science at Wesleyan University in Connecticut and worked briefly as a chemist before teaching public school in Kansas City (Page, 1984). The day after the House Committee reported unfavorably on House Bill 10, Mudge launched a series of lectures in Topeka on "Scientific and Economical Geology." According to press accounts, the speeches were quite a success. "The lectures of Hon. B. F. Mudge," wrote the Topeka Tribune, "are exciting considerable interest, among the members of the legislature, and the people of Topeka. He has spoken three times in Representative Hall, to large audiences whose close attention attests how deeply they are interested in his lectures" (Topeka Tribune, 26 January 1864, p. 2). Mudge's appearance at this point, and the crowds and interest he raised, may have helped House Bill 10 along. House Bill 10 was still alive in spite of the unfavorable review by the Agriculture Committee. Through a bit of parliamentary maneuvering, the bill was reassigned to a special committee chaired by Representative Laing, the measure's original sponsor. Only two days after the Agriculture Committee's blast at the bill, the special committee recommended approval (House Journal, 1864, p. 121) and on Saturday, January 23, the House, "after sometime spent therein," recommended that the bill be passed. Final approval came a few days after by a vote of 48-20 (House Journal, 1864, p. 179); Senate passage followed, with a few minor amendments, on Saturday, February 6, by a vote of 21-2 (Senate Journal, 1864, p. 170). Within a few more days the House had agreed to the amendments, the Governor had signed the bill, and in less than a month after its introduction, the measure was approved and the survey authorized. At that point, perhaps, the suspense should have ended. House Bill 10, however, allowed the Governor to appoint a state geologist. With the bill's passage the scramble for the plum began in earnest. Two obvious candidates for the job surfaced quickly. The first, Watson Foster, had long made it plain that he wanted the position, but on February 2 he asked Carney to take his name out of consideration because opposition was building to his appointment. Although he had previously collected the signatures of 21 House members in a petition supporting his candidacy, Foster said he was withdrawing because "Some of your [Carney's] friends are making such a bitter fight against my appointment," and by dropping out of consideration Foster felt he might "facilitate the passage of the bill through the Senate" (Foster to Carney, 2 February 1864, Carney Collection, State Historical Society). Once the bill passed, however, Foster changed his mind and asked that Carney at least appoint him assistant state geologist and "give me the position of principal if you can without too much sacrifice" (Foster to Carney, 22 February 1864, Carney Collection, State Historical Society). Evidently Foster's enemies and his earlier change of heart were enough to keep Carney from placing him in either post. The second obvious choice was George C. Swallow, well known for his work as the first state geologist of Missouri. Swallow had performed extensive geologic reconnaissance in eastern Kansas and held the proper academic credentials; at the beginning of the legislative session he was probably the betting favorite for the post. But on 19 January 1864, the Leavenworth Daily Conservative published a letter from one E.N.O. Clough that implicated Swallow in charges over the border war between Kansas and Missouri. "I desire to State that I understand he (Swallow) has been a prisoner for disloyalty since the commencement of this rebellion; and I know that in 1856, in Columbia, Brown County, Missouri, at which place both he and myself lived, he gloried in the name of border ruffian... (Swallow) is not such a man as we in Kansas desire to see placed in any position whatever, unless it be in a dependent one, when a good hemp rope would form the means of dependence" (Leavenworth Daily Conservative, 19 January 1864, p. 2). These charges obviously must have concerned legislators throughout the session, with the Civil War still being fought and only a few months following the burning of Lawrence by Quantrill's raiders. Foster refused to let such charges die. In his final letter to Carney, Foster added in a postscript, "I have in my possession an affidavit showing beyond doubt that Swallow did voluntarily pay the expenses of one border ruffian in fifty-five to invade the state" (Foster to Carney, 22 February 1864, Carney Collection, State Historical Society). Those charges, regardless of their substantiation, were probably enough to trouble Swallow's supporters. On February 24, a resolution was introduced in the House proclaiming support for Swallow, but it was "laid over" for lack of support, and Swallow's candidacy was effectively ended (House Journal, 1864, p. 454). 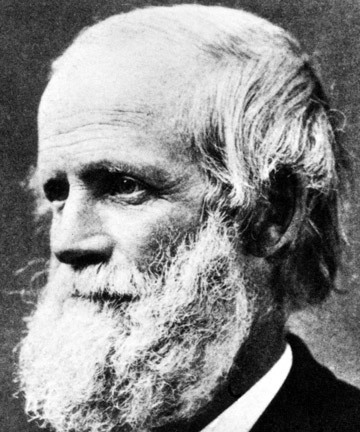 Benjamin Franklin Mudge, the first director of the Kansas Geological Survey. With the decline of the two most obvious candidates, Swallow and Foster, there was no certain contender for the job. No contender, that is, except for the Kansas City schoolteacher who happened to be in Topeka, delivering a lecture series on geology smack in the legislature's own hall. By the time the bill creating the survey had passed both houses, Mudge was the consensus candidate to be its leader. No record remains of Mudge's reaction to those who mentioned his name as a candidate for state geologist; if he did any self-promotion it must have been subtle, at least compared to that by Watson Foster. At any rate, a petition from the House of Representatives listed 42 legislators in favor of Mudge's appointment, and a similar entreaty from the Senate was signed by 20 members, although three other names on the list were crossed off with no explanation. At the bottom of the Senate petition, also, is the following note, signed by Mudge: "This petition was started without my knowledge or consent. I am in favor of the appointment of Prof. W. Foster" (Senate petition, no date, Carney Collection, State Historical Society). Regardless of Mudge's attitude toward the job, on 29 February 1864, Carney sent his nomination to the Senate and it was approved (Senate Journal, 1864, p. 459). With that, the struggle to establish a survey and appoint its leader was over. What were the results? First, the legislature had created a survey, envisioning a practical endeavor to inform Kansans about the extent of their minerals and the condition of their soils. The bill included no mention of science for science's sake. Second, it created a huge task for survey staff members. With $3,500, they were to survey a land area of over 82,000 square miles and report their results in less than 12 months. Third, partially because the Survey was something of an experiment in state government and partially because of concern over the usefulness of the results, the legislature kept the Survey on a short leash. The appropriation was small and had to be made annually. The head of the Survey was subject to legislative approval. In short, the Kansas Survey was not meant to be a permanent institution or agency; it was to study the state's minerals and soils as quickly as possible.